1. When did someone come to your rescue and can you tell us about it? Maybe my co-worker...we help each other out all of the time. We work with children that can have difficult behavior. It is just easier to have each other to depend on for help. 2. When did you help someone out of a jam and can you tell us about it? See above. I am there for my co-worker as well. 3. What are your thoughts on being a good Samaritan? Some states (like Florida) have even passed Good Samaritan laws so you don't get into trouble with the law for trying to help someone. I think it is great to help people. It is also good to have those laws to protect those that try to help. 5. Did you know that Pi is the most studied number in mathematics? Are you good with numbers? Goodness no! Math is my worst subject. 6. Tell us something random about your week. So remember Wacky Wednesday last week? This week we are having Pirate/Prince or Princess day tomorrow. I am going to be a Pirate. We have also had parent /teacher conferences this week. Next week is Spring Break. 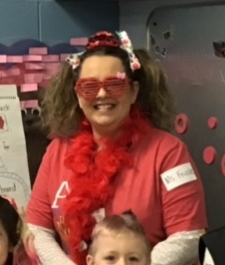 Here is my picture of me on Wacky Wednesday. We ended up not doing our hair pink. My name for the day was Mrs. Frizzle and all of the kids had different old names too. Thanks for joining the Medley, Lori!! What a fun classroom you have with Wacky Wednesdays! Pirate would be fun!! Enjoy! You are so stinkin' cute in this picture! ...and I'm so relieved you, too, are no fan of math. Judging from others' answers, I think we're in good company! Wednesdays are definitely wacky in your classroom lol but I bet the kids love it. Look forward to seeing the pirate pics. OH what a fun pic!! I bet you have the best time with the kiddos! Its nice to have a coworker that is there to help you!! Have a great week! Oh, my 9 year old Granddaughter just dressed for Wacky Wednesday and had such fun. Glad you have a co-worker you can count on. What a fun photo! I am happy you have someone to rely on.